There exist two fundamentally different business models; we break down the distinctions. Due to changes in lifestyle in urban areas across Southeast Asia, more local residents are becoming conscious of the importance of a healthy lifestyle. But, it comes with a stressful lifestyle and a working environment which deters them from eating consistently healthy. Also, rising disposable income, the value of time obviously outweighs product price, suggesting that groups of people are willing to spend more in exchange for saving precious time. As a result, it has lead to a surge in fiercely harsh competition for a new niche market in ASEAN: grocery e-commerce. As the use of the internet and support from governments continue the development of e-commerce, the average citizen getting used to placing orders on the internet. This phenomenon starts with the sale of fashion and electronic products and gradually increases the consumer’s desire for more diverse categories. 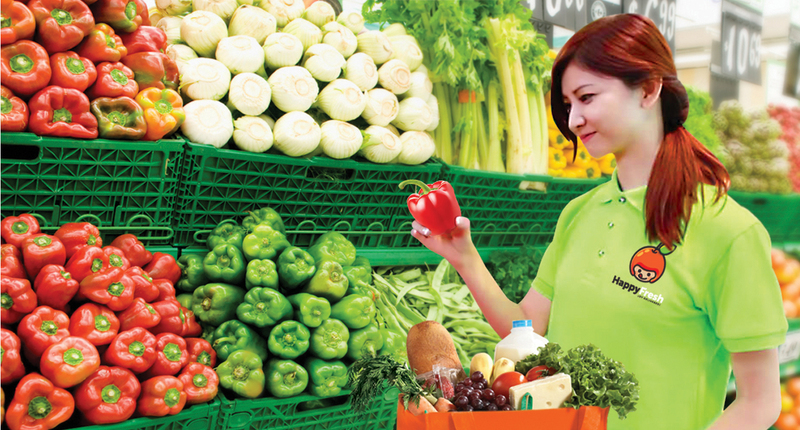 Therefore, new categories, including groceries and fresh produce, become widely available through the internet nowadays. Grocery e-commerce is one of the most capital-intensive spaces in the tech game. That said, right now, there are some leading companies achieving recognition from the general public in Southeast Asia and Taiwan. Most of them are young startups founded a few years ago. They often come with innovative business models and the current bunch consistently scale-up and enter into other unexploited but mature countries (especially in capital cities). While of course they have differences, all have loyal proponents using their product. But what exactly is the difference between the honestbees, HappyFreshes and RedMarts of Southeast Asia? Generally speaking, these supernovas can be roughly categorized into two-types of business model based on internal operating models — supermarket-oriented or warehouse-oriented. Let’s have a look and figure out how they work. A supermarket-oriented grocery e-commerce typically need not worry about the problems of product inventory. The reason is because the hot potatoes are handled by supermarkets that partner with the startups. The most important job of the startup is bringing the product from the partner supermarkets to customers by their own fleet of vehicles — usually in the form of motorbikes. Also important is designing the best algorithms to assist with finding shortcuts for couriers, making a profit by charging delivery fees or sharing the revenue from products bought via the startup platform. In most cases, they guarantee customers that the delivery will likely arrive within hours and can even choose substitutes if the desirable products are out of stock. The delivery of fresh but perishable food, such as meat and dairy, is also a feature and the differentiator from other grocery e-commerce because of the specially designed and heat-insulated box installed on motorbikes. HonestBee and HappyFresh are the two of the notable examples for this model. In essence, they are so-called ‘asset light’ companies, implying the facts of loose cost-structure, most expenses in labor and an easily scalable model. Take HappyFresh and HonestBee for example. They expanded their business into Bangkok, Manila, Hong Kong and Japan respectively within only two years. The astonishing expansion pace is because they can duplicate a viable business model into other markets quickly and efficiently with slight changes to account for localisation. On the other hand, the concept of a warehouse-oriented model is much easier to understand though the business model is far more difficult to establish. As the name suggests, the key difference is the use of warehouses as the core of the company’s strategy. More precisely, it is purely an online supermarket without any physical store. The grocery merchandise they sell are selected internally, then, stored in said warehouses as transfer stations. Merchants who adopt this model can offer highly competitive prices as compared to others because they save money on labour costs by delivering from the warehouse directly to the customer without any middlemen. Moreover, they are able to control the stocks and in-case stock runs low ensure every customer can buy any product without any substitutes. In addition, by consistently delivering quality product, they win consumer trust to their supermarket; not the delivery service. The self-owned fleet of logistics is also a critical component as this helps fill the gaps in last-mile delivery between e-tailers and customer. However, the high overhead from its warehouse and logistics system makes it difficult to expand into other countries. For instance, Redmart, founded in Singapore in 2011, finally got on the track to set up overseas branches after over four-years of effort and learning. That said, this business model is definitely not an easy one to be imitated, which helps current players because potential rivals may not present themselves for awhile. To sum up, it is inevitable for traditional retailers to move online or in collaboration with those marketplaces to reach more potential customer and create better user experience. Merchants with an understanding of how to onboard the best business model for their company can change the adversities into a positive turning point.